Lake season is here and there is no better time than now to upgrade the audio in your boat, motorcycle, ATV or golf cart! 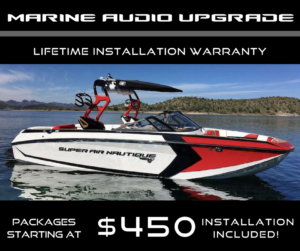 We have marine audio packages starting at $450.00 for 4 marine speakers and a marine head unit with installation included in the price. We also have a lifetime warranty on all of our installation. Appointments are filling up fast so call us to schedule yours, 316-943-8444.